That is the urgent plea of 14 Amish letter writers from as far away as Pennsylvania and New York state. For their family members who are married to Mullets, for their grandchildren, for the good of the Amish, please don't let him "become loose." The content varies little. Sam Mullet is running a cult. His followers are brainwashed. Things have begun to improve in Bergholz since his incarceration. But the strangest wrinkle is that letter after letter extends thanks -- to the judge, the prosecutors, and the FBI by name. That is how afraid the greater Amish community is of Sam Mullet. The Amish, one of the most independent, self-reliant populations in the country -- a network of communities that almost always wants to handle things internally assisted by nothing but God's grace and their own ability to forgive just about anything -- is grateful that the government stepped in. 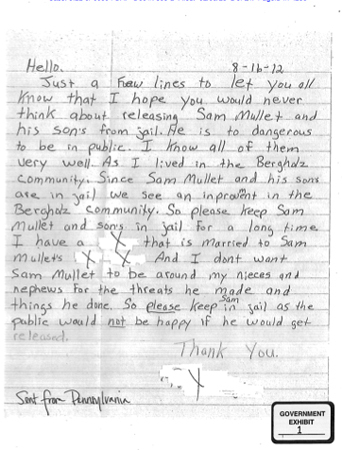 And they won't feel safe unless Sam Mullet spends the rest of his days in a federal penitentiary. And that is exactly what prosecutors are asking for. Federal sentencing guidelines call for a level 32 punishment, which translates to 10 to 13 years, but prosecutors are asking the judge for what's known as an upward enhancement. More time. They want life in prison for Mullet. Mullet and his merry band of hair-cutters are due to be sentenced tomorrow.